We’d love your help. Let us know what’s wrong with this preview of Scribes by James Wolanyk. Born into the ruins of Rzolka’s brutal civil unrest, Anna has never known peace. Here, in her remote village—a wasteland smoldering in the shadows of outlying foreign armies—being imbued with t Pawns in an endless war, scribes are feared and worshipped, valued and exploited, prized and hunted. But there is only one whose powers can determine the fate of the world . . .
To ask other readers questions about Scribes, please sign up. 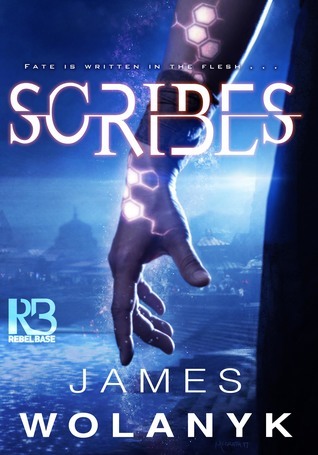 Scribes by James Wolanyk is the first book of the new fantasy Scribe Cycle series. The series introduces Anna who had been hiding her ability of being a Scribe and being able to carve runes into others flesh to grant temporary invulnerability against enemies. When Anna was forced to run she finds herself trapped by a tracker and as negotiations begin to decline Anna uses her ability to bargain. This puts Anna at the trackers mercy at which time Anna vows to use her ability to help fight to restor Scribes by James Wolanyk is the first book of the new fantasy Scribe Cycle series. The series introduces Anna who had been hiding her ability of being a Scribe and being able to carve runes into others flesh to grant temporary invulnerability against enemies. When Anna was forced to run she finds herself trapped by a tracker and as negotiations begin to decline Anna uses her ability to bargain. This puts Anna at the trackers mercy at which time Anna vows to use her ability to help fight to restore her homeland. I have to first admit the idea of carving runes into someone immediately had me thinking of the Shadowhunter series by Cassandra Clare in which they tattoo protection upon each other. This story however is pretty far away from that book in the type of fantasy that is contained within. The opening chapter quickly showed the reader just how dark and disturbing Anna’s world could be. Now while I did find this book to be an entertaining fantasy for the most part there were a couple of things that I noticed while reading that lowered my rating a bit. First, the style of the writing in the book is one that can be a bit on the overly descriptive/wordy side for my taste which does make parts drag to me. But I also thought to myself a few times that the story seemed a little jumpy getting from one scene to the next. Overall though it was a pretty intense darker fantasy for the adult readers. I received this via Goodreads Giveaways in exchange for an honest review. All my opinions are my own. Fantasy as a genre is polarizing among true literature connoisseurs. Despite many novels and series spanning lengthy epic sized tomes, authors are often criticized for being trite , or too detached or disengaged from the real world. I happen to love the genre, although I have agreed with the critics on many occasions as well. I have read some excellent series especially over the last couple of years. Those by RJ Barker and Josiah Bancroft come to mind. James Wolanyk's Scribes, the first in a 3 bo Fantasy as a genre is polarizing among true literature connoisseurs. Despite many novels and series spanning lengthy epic sized tomes, authors are often criticized for being trite , or too detached or disengaged from the real world. I happen to love the genre, although I have agreed with the critics on many occasions as well. I have read some excellent series especially over the last couple of years. Those by RJ Barker and Josiah Bancroft come to mind. 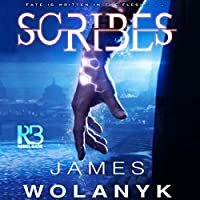 James Wolanyk's Scribes, the first in a 3 book series entitled "The Scribe Cycle" is a worthy addition to a small list of titles that I can refer to as highly literary fantasy. This novel about a young girl with the gift of granting invulnerability by carving runes on those around her, and her struggles to find light after tragedy, and accept the darkness that comes along with being a commodity is a tragic, and beautiful debut that promises even higher stakes as subsequent novels progress. Unlike many novels that bombard us with exposition, Wolanyk prefers to challenge us by dropping us in to a tense situation for Anna, the book's main protagonist from the get go. Much like Steven Erikson's Malazan novels (although far more focused) we are introduced to different races, and species from far off lands, and we are forced to imagine them in our own way. He does an excellent job of keeping characters gray and there are twists and turns around each corner as motives change, friends become enemies, and Anna's gift brings her a powerful new existence. James Wolanyk writes lyrical abstract prose. He tells a linear story , but much like David Mitchell, Salman Rushdie, and even James Joyce, he chooses to tell it with an almost poetic grace. Because of this, it can at times feel complex, and even strange. The claustrophobic feeling of a nightmare can all at once become a beautifully depicted dream and you will find yourself wanting to read individual passages over again to recapture the wonderful prose. Scribes just might be the most Grimdark Novel I’ve ever read, and I like to think I’ve read a lot of Grimdark. In its most brutal sections It is unrelenting in it’s shocking and powerful use of graphic cinematic violence. I’d go so far as to confidently state that a few scenes in this book make “The Red Wedding” seem like a child’s birthday party by comparison. It is also often a truly sad novel, it’s tone rarely shifting from the morose, but it does offer an underlying theme of personal growth, perseverance, and finding inner power. Bora, Anna’s spiritual master in an Obi Wan sense is a wonderful character, and Anna truly changes by the end of the book in to a powerful, almost Godlike being. I received a free advance copy of this book for a fair review. I thoroughly enjoyed reading Scribes and couldn't put it down. This is more than just a story of Anna, an innocent young girl who has the power of life and death, it is a story of lost innocence, of morality and of how good and evil are merely perceptions based on the vantage point you are looking at things from. Anna's simple, fairly safe, life in a war ravaged remote village, is blown apart when her father's betrayal forces her to I received a free advance copy of this book for a fair review. I thoroughly enjoyed reading Scribes and couldn't put it down. This is more than just a story of Anna, an innocent young girl who has the power of life and death, it is a story of lost innocence, of morality and of how good and evil are merely perceptions based on the vantage point you are looking at things from. Anna's simple, fairly safe, life in a war ravaged remote village, is blown apart when her father's betrayal forces her to run away with her little disabled brother and things go downhill from there. We are plunged from the start into a dark realm where dangers lurk everywhere, the worth of a life can be measured in grains of salt and reality can be harsh and cruel. She is thrust into the midst of grief, pain, deception, confusion, and the harshness of a world where she is unprotected, vulnerable and alone, not knowing who, if anyone she can trust. We follow her as she endures hardships, learns and acquires knowledge and finds inner strength. The action is fast paced in a world in turmoil as the fight for power rages on and brutality is the norm - Scribes are sought after because only they can grant temporary invulnerability, they are therefore captured and used by leaders of armies. Until now, the fact that Anna is a scribe has been kept hidden for her protection but once her secret is uncovered, there is no going back. She is torn from all that she knows and forced to question what if anything she has been told is true. Anna has the most powerful abilities of her kind and as such is sought after by ruthless leaders who will stop at nothing to use her powers to create legions of immortal soldiers. In such a dark world there are thankfully pockets of humanity to be found but the lines between enemies and friends can be hard to determine. I have never read this author books before. And when I started this book, I could not put it down. The way this book starts and progresses is awesome. I know with this genre that it's the authors perception. But the way this book is , I wonder how much research he had to do. It's just unbelievable how much is written in this book. It's a story about Anna. It's about her being young and innocent. But she ends up with so much on her shoulders. With war and her father's betrayal she is Outstanding!! If I had to rate the book with precise markings, it would probably be somewhere between 4 and 5, but I'm not sure where. I will say that it was a refreshing read, if nothing else. Scribes is the story of Anna, a young girl who can create life-saving magic using scars on her "victims'" bodies. The premise is fairly average for fantasy, but the real heart of the story was the emotional component of things. Over the years I' Note: I received a free copy of this book in exchange for an honest review. If I had to rate the book with precise markings, it would probably be somewhere between 4 and 5, but I'm not sure where. I will say that it was a refreshing read, if nothing else. Scribes is the story of Anna, a young girl who can create life-saving magic using scars on her "victims'" bodies. The premise is fairly average for fantasy, but the real heart of the story was the emotional component of things. Over the years I've lost most of my appetite for fantasy, since much of it is recycled themes, wars, and so forth, but I was intrigued by the author's description on his blog, which pointed to another type of fantasy that I, perhaps, hadn't encountered yet. The prose is fairly neat and I enjoyed it. At some points I felt that the characters were a bit outlandish, but it IS fantasy, so I can't be bothered with that too much. Additionally, the storytelling itself drags in a few places, but not enough to weigh down my enjoyment. Overall I found it to be compelling, only because the story didn't seem to pull any punches. The ending was satisfying, given the majority of the book, but I did find myself a bit troubled by some of the more graphic scenes later on. This was not a bad book, it was simply not a me book. It wasn't borING, but I was borED. I liked the world that was created here and how well things were described. I just didn't get into it all that much. It did bug me that that there were so many made up words for the languages here that were not always explained. Or things in general that were not explained. I also did not like the main character, Anna. I'm not sure of her exact age, but I know she is young. Maybe just barely a teenager or al This was not a bad book, it was simply not a me book. It wasn't borING, but I was borED. I liked the world that was created here and how well things were described. I just didn't get into it all that much. It did bug me that that there were so many made up words for the languages here that were not always explained. Or things in general that were not explained. I also did not like the main character, Anna. I'm not sure of her exact age, but I know she is young. Maybe just barely a teenager or almost a teenager. And it shows. She was so immature and naive that it drove me absolutely insane sometimes. I didn't agree with most of her decisions and I really disliked how she was so selfish so often. Anna had lived a simple life with her family, hiding the fact that she was a scribe. That is until her parents sell her younger brother, and in an attempt to save him, she takes him and flees. She's found by a guy that we only ever know as the Tracker (though I do have an idea of what he might have once been) and when she reveals to him that she is a scribe, her life will never be the same. Scribes have the power to cut runes into the flesh of people for protection/healing/or such, but they always fade. But Anna's are special as they apparently do not. So the Tracker convinces her to go with him back to his group and use her skills to further their cause. Throwing Anna into a world that she never thought to find herself and doesn't know how to navigate. And more often than not, her decisions can and do lead to the deaths or suffering of others. No matter what she does. There is a lot of fighting, a lot of politics, some good people, some bad people, and whole lot of "who do you trust?" going on here. It was an interesting story, but like I said, just not one I particularly got into so I won't be continuing it. Scribes is the first book in the Scribes Cycle from author James Wolanyk. Anna is a young girl, perhaps in her early teens, although we never find out for sure. The book opens with her running away from home with her younger brother who has been sold by her parents for reasons that are never really made clear. When they are trapped by a tracker, Anna reveals that she is a scribe – a person with the power to cut runes into another’s skin, conferring temporary immunity from harm. Anna agrees to go Scribes is the first book in the Scribes Cycle from author James Wolanyk. Anna is a young girl, perhaps in her early teens, although we never find out for sure. The book opens with her running away from home with her younger brother who has been sold by her parents for reasons that are never really made clear. When they are trapped by a tracker, Anna reveals that she is a scribe – a person with the power to cut runes into another’s skin, conferring temporary immunity from harm. Anna agrees to go with the tracker if he will leave her brother alone. Things don’t go to plan but from here, Anna’s life just gets worse and worse. This is an unrelentingly dark book. The world it is set in has faced war and civil unrest for all of the recent past and people kill without regret. Anna is convinced that by helping the tracker, she will be helping to restore her homeland and remove all of the ‘wicked’ men. Of course, Anna is barely more than a child and she has a child’s simplistic view of wickedness. There is only one character in the book who can really be described as kind; the herbman who takes care of Anna when she is injured and close to death. In the end, Anna repays his kindness by stealing away his adopted son, breaking his heart in the process. I have some really mixed feelings about this book. First the bad. The reader is thrown into the world with little explanation of how anything works or how things stand. While I’m not afraid to learn as I go, the problem was that some things are just never really explained. Like the conflict that drives the story – what are they fighting over? Who are they really fighting? Why does Anna have to save her home land? The author uses a lot of made-up words and at times it is not clear from the context just what they mean and this works against the author. For example, the soglav that the tracker has with him is presumably a terrifying beast, however it’s not really described so the reader doesn’t get any real sense of what it is. That means that the reader can’t be horrified by it, can’t connect with Anna’s fear of it and understand the threat it poses. This is just one example of a problem that continues through the book. It’s clear that the author has put a lot of work into the construction of this world – I just wish he’s shared a bit more of that work with the reader. The characters are hard to connect with. Most of them are unpleasant. Anna herself is in a horrible situation and attempting to come to grips with her powers but she is also selfish and weak. The tracker is awful but mostly disappears in the second half of the book. Bora is interesting but too enigmatic and abrupt to really form an emotional bond with. The author has a beautiful way with words. Although some of the text is quite dense and tales a little effort to read, it’s well worth it for his use of language. Some really lovely turns of phrase and descriptions. The book deals with some really big concepts: what it means to be evil and how that can change depending on where you’re standing, what it means to have power over life and death and the responsibility that comes with that, the damage that war does to everyone who has to live through it. I’m glad that I had the chance to read Scribes and I’m sure that there are elements of the story that will linger in my mind for a long time. This is one of those reads in which you must go in with an open mind, especially the build-up. Our main character is Anna who starts off the story running away from home with her handicapped little brother in order to save him, but when in-between a rock and a hard place drops him like a bad habit and essentially writes him off. Her world is full of different cultures within different lands all vying to over take each other through the use of scribes. Scribes are those with magic carvings in one This is one of those reads in which you must go in with an open mind, especially the build-up. Our main character is Anna who starts off the story running away from home with her handicapped little brother in order to save him, but when in-between a rock and a hard place drops him like a bad habit and essentially writes him off. Her world is full of different cultures within different lands all vying to over take each other through the use of scribes. Scribes are those with magic carvings in ones flesh and Anna had been hiding the fact that she was a very powerful one that ultimately gets manipulated for her magic. A dark, descriptive read that shows both sides of humanity, mostly the evil side. However, this IS the first book in the series (Cycle #1) which sets the stage for the rest of the waging wars of the world. Scribes centers around a group of people called Scribes where they have the ability to grant invulnerability to individuals who need protection. Ana is quite different. The scribes don't fade. They last forever! That's right! Forever. The story keeps you involved and guessing. Ana is a strong character. Her growth during the novel is realistic. Many of the characters are relatable. The world is built well. There were a few times when my attention wavered, but the story is very well written. I re Scribes centers around a group of people called Scribes where they have the ability to grant invulnerability to individuals who need protection. Ana is quite different. The scribes don't fade. They last forever! That's right! Forever. I actually started reading Schisms first because I requested for an arc ebook from Netgalley. After about 3 chapters into it, I realised Dang! this is the second book of an ongoing series. So I just had to buy this ebook Scribes which is the 1st book of the series which I found is on Google Play Books. So okay, fine.. I went and bought it. I totally have mixed feelings about this book though truth be told, I didn’t regret buying this just to understand the 2nd book Schisms better. 1. I still don’t know where’s the head or tail of this story is sometimes, meaning; it’s very fast-paced and action-oriented, it feels like I was reading an action movie in book form. Sometimes I can’t figure out how I happened to be at that point in the book because it was too fast-paced maybe or shall I say, the plot or scenes are jumping or are being transitioned too abruptly? 2. This book is too wordy at times, there’s a need for a glossary because there are too many new words not explained in this book although I know, this is a science-fiction book so there’s definitely new words for world building and describing some stuffs. Anyhow, I still don’t know what are kales, and nope those are not vegetables. Anyhow still, this book has a good enough plot and interesting premise and I still enjoyed it somewhat due to some conclusions or events that really ties up the story neatly. But truth be told, this was the most unfriendliest book that I have ever encountered hence the quite poor rating. Unfriendly because the author doesn’t care to explain some things, places or people in simple layman terms (just my opinion). I do agree though that the author has a way with words, but the way he structures his sentences made it too compact, too much info and images in a sentence it gave me a massive headache just by reading this book. I guess this book is a few levels up from what I normally read, so it’s not the author’s fault why I didn’t like this book. The way the sentences are structured and the words, some that totally have no explanations whatsoever really alienate me to this work that I otherwise could call brilliant and outstanding just because of the interesting premise, the journey the protagonist goes through and the satisfying ending for Book 1 that satiates my curiousity enough for Book number 2. This book is so hard for me to read. I had a massive reading slump when I was reading this book. I didn’t know that reading could be so hard. I hated reading just because of this book. I’m sorry. This book has so much going for it but I was plodding too deeply, struggling with whatever strength I had left, I just couldn’t understand why I picked this up (and the second book too, especially – maybe because of the nice cover, LOL). I totally guess this just isn’t my cup of tea (or coffee). And lest you think that science fiction is not right up my alley, I totally dig Dune by Frank Herbert and books by John Scalzi. I’m not sure whether I’d go buy the 3rd book when the author finally writes it (since the 2nd book Schisms recently came out), I’ll just see when the time comes. It’s just so amazing that I didn’t dnf this book, I think I’m great because I had so much patience in reading this book. On second thoughts, to be fair maybe you guys should give this book a chance (only if you’re crazy about stuffs like different worlds and civilizations, science fiction, fantasy and stuffs like that, or if you like the sound of the synopsis from Goodreads, like I did). Who knows, you might like (or even love) this book, but a heartfelt warning, it’s not for those who are of the faint-hearted whose books they usually read are not as wordy as this one. I had ordered a copy of Scribes a while ago, but only now ended up reading it. The book is written very poetically, every little detail is mentioned, so you feel like you are there with Anna, overlooking every event and imagining how differently you would make all the decisions that Anna is faced with. Anna is a fourteen year old girl, who is angry with the world because of her father and then because of the Tracker, yet she’s trying to make her home a better place. It’s surprising that the main I had ordered a copy of Scribes a while ago, but only now ended up reading it. The book is written very poetically, every little detail is mentioned, so you feel like you are there with Anna, overlooking every event and imagining how differently you would make all the decisions that Anna is faced with. Anna is a fourteen year old girl, who is angry with the world because of her father and then because of the Tracker, yet she’s trying to make her home a better place. It’s surprising that the main character Anna is written appropriately for her age and gender- a bit annoying, eager to learn and imagining that she knows what good and bad looks like. Along the way we meet such interesting characters as Tracker, Shem and Bora. They most certainly are not one dimensional characters. Tracker and Bora were easily my favorite characters, as they have some mystery about them and you ache to see them more in the story. The book itself is very dark and definitely not meant for the faint of heart. It’s like a cross between Harry Potter and Game of Thrones. The main characters is young and incredibly powerful, while the world created in the book is dark and gloomy. And from the moment Anna arrived in Malchym I couldn’t put the book down, I just had to read it till the end. And I’m ordering the second book ASAP, because I need to know what happens next. And there are even better lines in the book, which I don’t want to spoil here for you. So if you are a fan of fantasy, and you like thought provoking books, then this is the book for you. Definitely recommending it to everyone I know. Overall I really enjoyed Scribes. I admit, there were a few moments where I struggled to soak up all the names of cities and the world created! There is quite a rich amount of world building going on which is awesome, but means at times I had to reread sections and focus myself on getting into the story. Besides that though, there is a good array of characters, all very memorable and different, both in looks and personality. The different terrains they were in kept giving me a fresh perspective o Overall I really enjoyed Scribes. I admit, there were a few moments where I struggled to soak up all the names of cities and the world created! There is quite a rich amount of world building going on which is awesome, but means at times I had to reread sections and focus myself on getting into the story. Besides that though, there is a good array of characters, all very memorable and different, both in looks and personality. The different terrains they were in kept giving me a fresh perspective on where they were and how their journey moved onwards. Plotwise, it was strong from beginning to end, with Anna growing as a character throughout. -I received a free copy of this book in exchange for an honest review. Scribes, by James Wolanyk, tells the story of a young girl who, through her gift, was able to see the world as how it truly was, both in its beauty and its corruption. Anna, first of Thomas, was running from trackers alongside her younger brother, Julek. When Julek is killed, she is taken in by a tracker who recognizes her abilities as a scribe. She then goes up North, where she meets a young boy named Shem, as well as a woman -I received a free copy of this book in exchange for an honest review. Anna, first of Thomas, was running from trackers alongside her younger brother, Julek. When Julek is killed, she is taken in by a tracker who recognizes her abilities as a scribe. She then goes up North, where she meets a young boy named Shem, as well as a woman named Bora, who shows her the realities of the world. As she continues on her journey, she realizes that sometimes, she has to stand up for herself if she wanted survive. In this fantastical novel, Wolanyk illustrates that not every gift is blessed, and that even power that can heal can lead to the most devastating consequences. I enjoyed the relationship between Anna and the tracker. While the tracker did seem heartless at first, I did come to admire him. He knew people would do anything for salt, and even called out her parents for it. Not only that, but it’s like he was mentoring her, making sure she knew what to do and how to survive in the world. Bora did the same thing, although even now I still find it hard to trust her. Shem, on the other hand, was completely innocent. He felt like he only had to rely on Anna, that he could protect her and that everything will be fine. He got his first taste when they came to the orza, where she didn’t call him by his name, when he experienced jealously for the first time. All these characters played a role in Anna’s development, forcing her to see what life truly was. The world Anna grew up in was also astonishing. From being sold out by her parents to being worshiped as as goddess, it was all she could do to not let that perfect life go to her head. On the surface, it seemed like a fairytale come true, but even so, there was still something sinister festering in the darkness. People like the traveler, Bora, and Shem helped her find her way, made sure she wasn’t swept up by the gilded promise the orza promised her. Because in the end, she can’t afford to. She had to grow up quickly, and the only thing she could do was simply live her life, not only as a scribe, but as a human. I did wish that the relationship between Anna and Konrad were more fleshed out. But more than that, while I did think it cute, I also felt it was a bit out of place in this story. I would’ve preferred more of a transition between scenes; there were times when I had to reread the sentence simply because the locations suddenly jumped from one place to the other. Nevertheless, I did like the book. While the sudden change in scenes can be dizzying, Anna’s development, as well as her relationships with the other characters, make the book unpredictably wonderful. Wolanyk shows that the world isn’t at all like the fairytale we often dream of, that it comes with its own set of dangers. As such I would give this book a rating of a 3.4 out of 5.0 stars, and recommend it to those who love Howl’s Moving Castle by Diana Wynne Jones and Updrift by Errin Stevens. I started this with few expectations, just something to read, to pass the time. By page 50 or so, I knew I'd struck gold. This is easily the best book I've read this year and with the prose that reminds me so much of Bakker, close to becoming a favourite, depending on how the next books work out. The character development is top-notch, Anna feels very real, progressing through the book, clearly growing in many ways. The single POV is new, at least for me, but I think it helped the story a lot. I I started this with few expectations, just something to read, to pass the time. By page 50 or so, I knew I'd struck gold. This is easily the best book I've read this year and with the prose that reminds me so much of Bakker, close to becoming a favourite, depending on how the next books work out. The character development is top-notch, Anna feels very real, progressing through the book, clearly growing in many ways. The single POV is new, at least for me, but I think it helped the story a lot. It is common to have multiple POVs, sometimes in different locations, but it often feels disjointed, breaking pace and coherence. Sticking with Anna the whole way, felt right to me, though one problem with this approach is if a reader doesn't like the character, they're basically stuck with them the whole way. The magic system also intrigued me, I'm always a sucker for these. The system felt reasonably balanced, offering great power but also something of a drawback as Scribes can't mark themselves. I don't think I've read anything quite like this yet. In any case, if I have any complaints, its that there's too many new words even for me, not just names but common nouns and adjectives, and not nearly enough context to deduce what they mean. At least Bakker with his mad world-building provides a glossary, and even then most of his new words are names, still uses English for descriptions and regular language. It doesn't help that the "pronoun game" is often played out in these parts, and metaphors (indigenous to this world, no less) freely mix with literal meanings. So it was occasionally frustrating, knowing that there's some amazing tale being told here but I just can't understand the whole thing, forced to make guesses. An interesting premise that caught my attention, but there were too many issues to keep my interest. Too much of the story defied logic. Not in a fantastical way, but in a “that doesn’t make any actual sense” sort of way. Right from the beginning. The book starts with Anna running away from home with her little brother because he was sold for an unknown purpose. Her brother is handicap and always rides a pony when they leave the house. Her escape was planned in advance, but she left the horse be An interesting premise that caught my attention, but there were too many issues to keep my interest. Too much of the story defied logic. Not in a fantastical way, but in a “that doesn’t make any actual sense” sort of way. Right from the beginning. The book starts with Anna running away from home with her little brother because he was sold for an unknown purpose. Her brother is handicap and always rides a pony when they leave the house. Her escape was planned in advance, but she left the horse behind. Then while on the run one of the trackers catches up to them. Anna makes a bargain, but she comes up with the idea to leave her brother and she will run off with the tracker. What? She loves him, he’s handicapped and can’t continue on, they ran away so he could be free, but she wants to leave him to the men who will take him to be a slave. It made no sense. That beginning set the tone for other things that are simply nonsensical. I happened upon this book on a Reddit AMA James did a while back, and decided to give it a go. Firstly, if you read this book, get a paperback/e-book version. The audible narrator made this almost impossible to finish. After the somewhat unbelievable events that happen in the beginning with the MC stranding her crippled brother, there were portions where my expectations were raised, and I was genuinely enamored with James's world-building and character relationships. But the euphoria slipped away I happened upon this book on a Reddit AMA James did a while back, and decided to give it a go. After the somewhat unbelievable events that happen in the beginning with the MC stranding her crippled brother, there were portions where my expectations were raised, and I was genuinely enamored with James's world-building and character relationships. But the euphoria slipped away pretty quickly. Anna is not an enjoyable MC to follow. She makes naive decisions again and again, adding a layer of depression onto a layer of despair. Nothing happens in this book to equalize it. I also found James's action scenes to be dizzying and hard to follow. Having listened to it and not read it, I can't say for certain, but I think the prose could be simplified in certain sections. This book did not work for me, and a large part of that boils down to personal taste, which is why I am deciding to not leave a rating on this book. But there are plenty of five stars here, so don't let me be the guiding voice! I saw a post on Reddit that the book was on sale, after a search it was available on kobo too for about the same price. Decided to buy it and read it whenever I felt like it. Now I'm finished and my feelings are mixed. The same way I felt like after finishing the Gardens if the Moon by Steven Erikson, What I mean by that is that it is written as a story where as a reader you lack information that is common knowledge for the characters. But by just continuing to read you slowly get a better sense I saw a post on Reddit that the book was on sale, after a search it was available on kobo too for about the same price. Decided to buy it and read it whenever I felt like it. Now I'm finished and my feelings are mixed. The same way I felt like after finishing the Gardens if the Moon by Steven Erikson, What I mean by that is that it is written as a story where as a reader you lack information that is common knowledge for the characters. But by just continuing to read you slowly get a better sense of the factions and the people. The book was not for me. The characters did not seem to be very developed, I had no sense of how much time was passing between events, and the story seemed to jump around. The synopsis of Scribes caught my attention and I was looking forward to it. It was a disappointment: I couldn’t connect to the world or the characters for the entire book. It starts well: siblings on the run from trackers. They get caught and the older sister tries to bargain her secret power as a scribe to save her brother. It backfires, the brother gets killed and she ends up taken prisoner by the tracker. I started to get a grip on the characters and what being a scribe meant. One of the main problems was that I didn’t like Anna. She starts off alright; a frightened girl in over her head, struggling to keep a secret. But her refusal to leave Shem forces the boy into a sort-of-slavery, and Anna doesn’t care about the consequences. She uses his awe of her to suit her own purposes, then treats him like a jealous lover, or a tool, for the rest of the book. Anna enjoys her power. She likes being the chosen one, being considered as a goddess. She thinks it is her right. Of course, there are passages of her lamenting that she can’t control it etc, but apart from refusing to mark a few of the darker characters, she makes no attempt to use her power to help people, or think about the consequences of marking those attempting to wage war on others. She mourns her brother, but never thinks about the destruction she is causing in his name. It’s always fun when the lines between the good guys and the bad guys are blurry, but in this case, I struggled to identify friend from foe. Anna’s own opinions do not help: she states she hates the tracker but does nothing to escape from him. She thinks negatively about Bora, yet seeks her counsel and advice. It read as if the character relationships progress, but Anna’s thinking doesn’t, leaving the reader muddling their way with no clear idea. There are no strong characters: the tracker dissolves into the background, Bora is to abrupt to connect to her, Shem acts as a jealous child and even a supposedly-powerful leader is nothing but a shell by the end. I also couldn’t figure out the world. There were a lot of fantasy-based names and places, but nothing to ground the reader. I couldn’t figure out the world the characters lived in, meaning I couldn’t connect or envision it. This is a book about morals, responsibility and power. It is about considering the consequences of actions: what it means for Shem’s family that he is forced to leave, what it means to have violent men forever marked and made invulnerable, what it means to hold the fate of people in your hands. For me, however, Anna never considers those consequences; she acts as she wants and uses her status as a goddess to get away with it. This book was incredibly hard to finish, and I'm surprised I did. There was so much about it that lost me. Although I did like the premise of the story, just disappointed I didn't enjoy it more.